Recently I went with a few friends (this is Kat, the one I was telling you about!!) 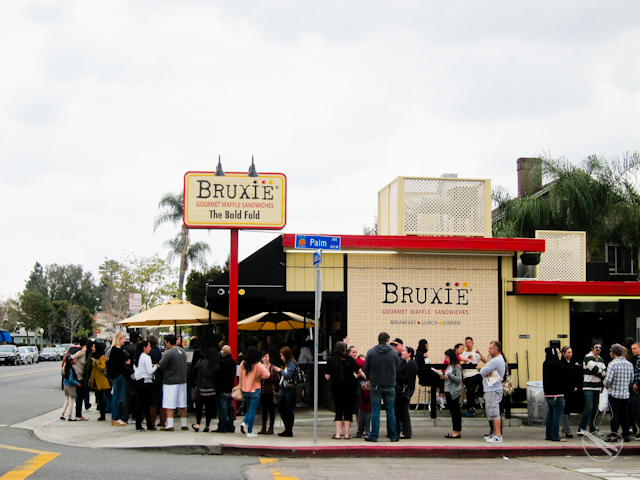 to check out Bruxie. Bruxie was Yelp’s number 2 most popular restaurant of 2011 (nationwide) so I couldn’t help but ask.. Really?? Number 2? I had to approach this potential Dish carefully by trying different things during different occasions. It only took two trips and five different entries (not all for me mind you, I share!) to understand why this Bruxie (new location in Brea) tops lists. At one point the parking situation in Old Towne Orange was horrendous during lunchtime on the weekend, but I have a thing for old houses, so walking through the historical neighborhoods with Mark was a bit of a treat for me. But beware, parking, and lines, are against you. 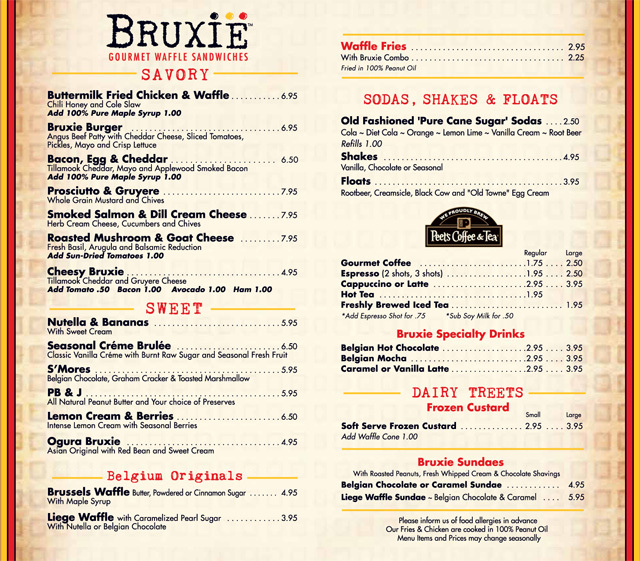 While you are waiting you are greeted by Bruxie staff with a menu, helping you with any questions you may have. I was surprised to learn that 2011’s #2 is technically a stand. There are no restrooms on the premises (but they do have a sanitizer dispenser for your grubby hands) and finding a table can be a bit of a struggle, but the friendly staff and waffle batter make up for it. Waffles you say? Yep. 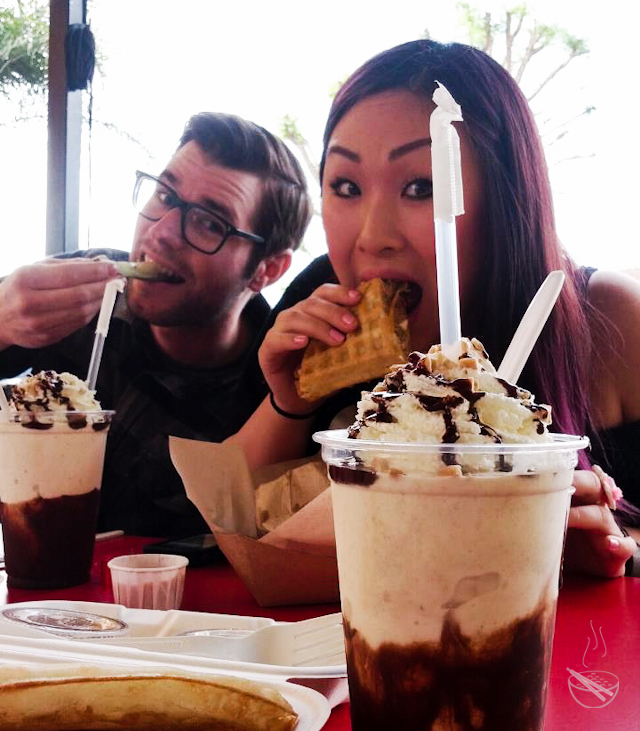 Bruxie is famous for gourmet waffle sandwiches. They are the lightest, fluffiest, most delicious waffles and work surprisingly well as a “bun” for the yummy Bruxie Sandwiches. They cater to “Savory” and “Sweet” creations, and my first introduction to them was the “Sweet” Seasonal Creme Brulee Waffle Sandwich, “classic vanilla creme with burnt raw sugar and seasonal fresh fruit.” Yes, it was as good as it sounds. On the second occasion I went with the Buttermilk Fried Chicken and Waffle. I also had this the first time that I went, but it was worthy of a double take. There is a really crunchy (not super mayonnaise-y) slaw and a spicy chili honey. The breast is cooked to perfection and is so tender it all works so well, every flavor and texture is always identifiable and never competes. 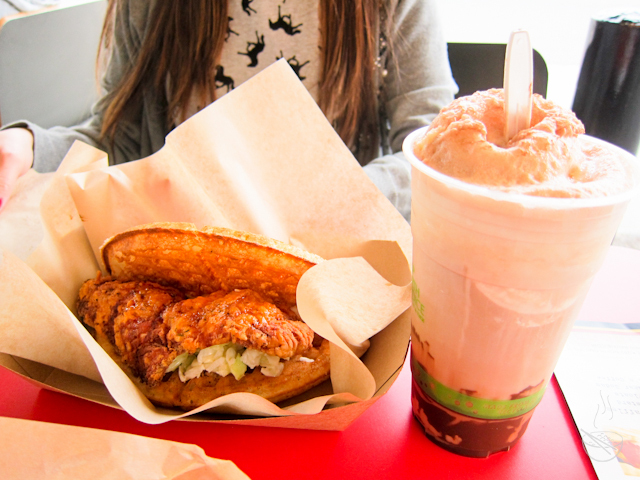 You can taste the chicken, waffle, sauce, and honey (which I can not stop thinking about!) individually. 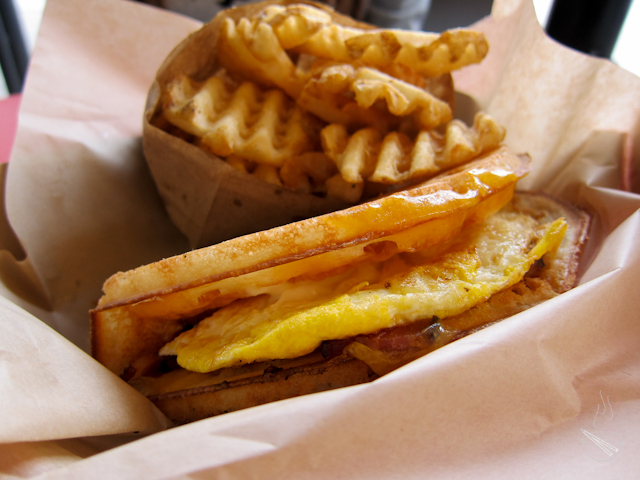 Mark wanted “something breakfasty”, and you don’t get anymore breakfasty than your classic Bacon, Egg, & Cheddar between a Bruxie waffle. A few bites were exchanged. The egg was cooked exactly how I like it (slightly runny, but not to the point where it is messy), the bacon wasn’t greasy, and it had just enough cheese to never feel omnipresent like most breakfast meals. Again, all ingredients registered. And to top it off, it still had enough of your typical “sandwich” feel to it where an old fashioned egg cream soda was the perfect accompaniment. Although, a word to the wise, the old fashioned egg cream soda is strictly ol’ fashioned, and I’m not replacing that “d” with an apostrophe for fun either. It’s made the way it was back then, frothy, light, and, as some would find it, lacking modern sweetness. well guess who is salivating now?!?!? omg, it all looks and sounds so delicious! and about 14 scrillion times better than the generic turkey sandwich i am currently nomming on! This looks great. I was in Orange with the girls two weekends ago, we were walking around looking for a Farmers Market (which we eventually found, which had live bluegrass! Shwoah!) anyway, Parenthetical digression aside, I saw this restaurant, it was packed. I had no idea what it was, but seeing your picture above it clicked. It’s so tough to stand in a line with a 2 year old and a 3 year old, we did the Anaheim Art Crawl and Abby was so bored waiting by the food trucks that she finally just started laying down. On the ground. In the middle of throngs of strangers. This concept looks awesome, though. I like the Waffle sandwich idea, and I’m going to figure out a way to try this. Pay a stranger to order my food while I play in the street with the girls? Perhaps. The first time I went, it was around noon and the line really wasn’t terrible. The 1:00 line is pretty bad. I bet if you were to go at around 11:45, you would be okay. god that all sounds so mouthwatering…and fattening…which explains the #2 standing. i’d definitely try it. I shouldn’t have looked at this when I was hungry! That looks so freakin’ amazing!! !